Marvel each time you turn on the light at the intricate design which features 1 light and a Hardwired switch. Put this light on your wall to really make your room glow. 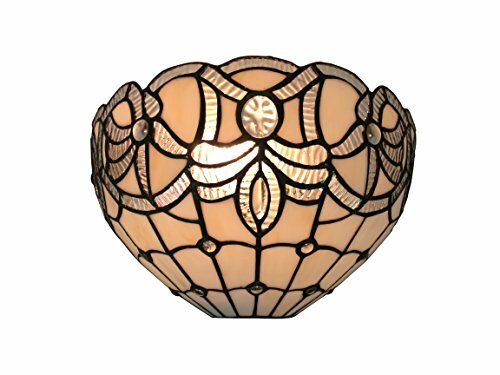 Overall width: 12 inches Overall height: 7.25 inches Requires One (1) maximum 40 watt E27 type A bulbs (not included) Switch type: Hardwired Glass count: 119 pieces Cabochon Count: 15 pieces Fixture finish: Dark brown Materials: Tiffany-style stained glass, metal hardware, electrical components Certification: UL listed Number of Light: 1 Light Light Bulb Type: Incandescent Lighting Type: Sconces Handcrafted using the same techniques that were developed by Louis Comfort Tiffany in the early 1900s, this beautiful Tiffany-style piece contains hand-cut pieces of stained glass, each wrapped in fine copper foil. Attention California residents: This product contains lead, a chemical known to the state of California to cause cancer and birth defects or other reproductive harm Note: Shade colors will appear darker and less vibrant when not illuminated. This stained glass product has been protected with mineral oil as part of the finishing process. Please use a soft dry cloth to remove any excess oil.